At Marks Auto Service, we take our business very seriously. This means that our continuing mission is to provide Legendary Customer Service in the Oakville area. Every customer is equally important to us – no matter how big or small the job is. 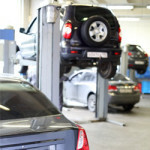 A modern auto repair shop equipped with the most current technologies and equipment. A professional staff of experienced auto repair mechanics – with ongoing training so that we remain up-to-date on the latest techniques, tools and technologies. A dedicated service team to ensure your customer service experience is beyond exemplary – from start to finish. Learn about our Customer Care Program. So, no matter what type of vehicle you own – car or truck, big or small, import or domestic – you can rest assured that when you choose Marks Auto Service for your auto repair service needs, you will be well taken care of. Plus, we back up all our work with our Local and Nationwide Auto Repair Warranties. Electrical repairs and services – alternator and battery services, fuses, wiring, etc. Marks Auto Service is a Drive Clean Emissions Accredited Test & Repair Facility. We are also experienced Fleet and Commercial Service specialists. Call us today to schedule your appointment, or use our convenient Real-Time Appointment Scheduler.